Switching to a porcelain clay body may seem like an easy enough thing to do, but if you’ve ever worked with porcelain, you know it is not as easy a switch as you might hope. That’s why we put together this post on porcelain for beginners! In this post, an excerpt from Working With Porcelain, Antoinette Badenhorst, shares eight helpful tips for working with porcelain that will help beginners get off to a great start! – Jennifer Poellot Harnetty, editor. Sure porcelain can be a challenging clay body to work with, but by keeping some important tips in mind, you can have success when getting started with it. Here are some guidelines on porcelain for beginners that will help you along the way! 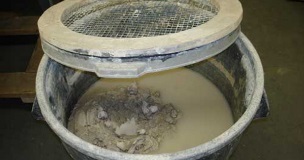 Always wedge clay from a few hours to up to a day before using it to make sure that the water content is evenly distributed throughout the clay ball. This also helps to orient the clay particles into a circle or spiral. Although aged clay is stiff during the first few wedges, it’s much better than freshly made clay and it quickly softens. Allowing the porcelain to rest after it’s wedged is important, because it tends to fatigue easily. 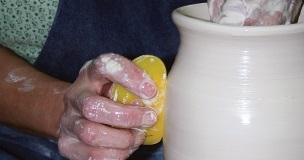 Pay special attention to centering and always cone the clay to get all the clay particles lined up. Many potters consider coning as just another way of wedging, but in many instances porcelain reminds me of the fairy tale of the princess that could not sleep with a pea under her mattress. The slightest little lump or unevenness can force you back to the beginning. Handle the clay as little as possible to limit it from getting fatigued. I manipulate the wedged ball into a pear shape and place it with the small end downward on the wheel head to take advantage of the circular movement that started forming during wedging. I further define the lineup of clay particles through the coning process. Porcelain is normally thirsty, absorbing water quickly, and collapses easily when too much water is used. Even a more plastic porcelain clay body functions better with less water. Adding a spoonful of vinegar in the throwing water gently deflocculates the clay and helps in lubricating the clay. Since porcelain shrinks more than other clay bodies, using less water limits the problems related to shrinkage. Porcelain cracks easily for different reasons. If basic rules are important for working with other clay bodies, it becomes of the utmost importance to porcelain. Uneven thickness in clay walls and attaching pieces of uneven dryness will result in cracking. Cracks in the bottom of a form are usually caused by uneven thickness throughout and/or improper compression. Some cracks in the bottoms are caused by water left inside, which weakens the bottom. Cracks on rims are usually caused by too much pressure applied when trimming the foot. Using a foam bat on the wheel head while trimming absorbs the shock and eliminates most rim cracks. You can also prevent excessive pressure on fragile pieces by using sharp tools. Metal kidney ribs and Surform blades are some of my most important trimming tools. Fill a spray bottle with water and use it to keep the pieces damp as long as is needed while you’re working on them. Be careful as it takes some training of the hand and eye to prevent delamination of walls when spraying semi-dry pots to rehydrate them. Every porcelain body is different and needs to be evaluated separately, especially while drying. To be safe, never leave freshly thrown work in the open air longer than 15–30 minutes, no matter if you are working in Mississippi or Arizona. Here are two simple systems for keeping unfinished pieces leather hard for weeks while you work on them. Invert a lidded food container, set the pot on the inverted lid and place the container over top of it to seal the pots in while they are in process. Make a damp box by taking a plastic storage box, and pouring an inch or so of plaster into the bottom. After it cures, dampen the plaster slab and it will slowly release moisture into the air within the closed container. clay, compression, foot, leather hard, porcelain, set, shrinkage, spraying, trimming, wedging. There are a few very good porcelains available in the UK. I worked with the leach bodies, which is grolleg based and nice to work with. Audrey Blackman is also a good one. It tends to warp if it is not treated well. Harry Frazier and Royale are all good ones. I worked with a JB Porcelain from Potclays when I taught a class at La Meridiana last year. A good one to test. Greeting from the UK! Really useful article – goes a long way to explaining all my nightmare experiences trying with porcelain after making progress with “easy” bodies. Maybe happier times lie ahead – certainly worth persevering. A body described as semi-porcelain is obtainable over here and I guess across the pond as well. Any experience or comments on this stuff? Great article. I learned lots. One question. I am rolling porcelain to make circular discs and three of four fired perfectly flat but the fourth one which was fired on the same shelf warped. Any suggestions about what may have caused this or how to prevent it? What does “fatigue” mean in relation to porcelain. Why let the porcelain rest after wedging & for how long; an hour, a day? Do other clays become “fatigued”?